CAC,BOB, Best in Group & BEST IN SHOW of all breeds!!!! 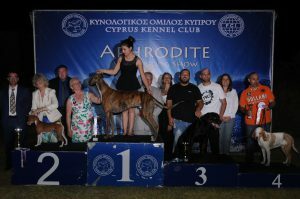 CACIB, BOB, Aphrodite Winner 2017 and BEST IN GROUP! First German bred Greyhound UK CHAMPION in history.